Did you grow up in the land of pop tarts and toaster strudels? The land of frosting and sprinkles and icing in a foil package? Thank you 90s. I totally did, though I enjoyed them more as a snack than breakfast. When it came to before-school breakfasts, I was hooked on an English muffin with peanut butter and honey. And sometimes banana. I’m still hooked on that! How boring. If needed, I could get by on a cinnamon brown sugar pop tart and I most definitely remember when s’mores pop tarts came on the scene. THAT was huge. The thing with pop tarts though? I never wanted to eat any of the unfrosted crust. So I basically cut the already-rectangular shaped tart into a smaller rectangle and ate just the frosted section. And it never tasted as great as I hoped. I didn’t have any real cravings while I was pregnant, but one day I was walking in the grocery store and thought a pop tart sounded just fabulous. Can I insert the face-covering monkey emoji here? I got home and toasted that thang. It was brown sugar cinnamon, of course. And it was just… meh. Meh meh meh. Actually pretty gross. Needless to say, my childhood nostalgia was not found in the gooey sugary center. I was never really a toaster strudel gal (except I think they had chocolate? And I think I tasted it once? of course.) because – get this – I didn’t like the icing on top. So strange. The flakiness though! Oh the flakiness. That was something I could get behind. And no, I don’t mean my own flakiness. The strudel’s flakiness. These little pastry tart things are probably more like a toaster strudel than a pop tart, buuuuuut, they kind of look like a pop tart right? They are maybe like a pop tart toaster strudel hybrid? Plus, since I’m on a temporary hiatus from pie crust (WE WERE ON A BREAK! ), puff pastry is the way to go. Remember last year at this time when I became wildly nutty over puff pastry? GAH. It’s so delicious. And buttery. And flakey! More flakiness. From me this time. I desperately want to make my own but since I no longer have ten hours to roll out flour and butter, that may have to wait. So. I made two versions of these little pockets o’ love. First, this smoked cheddar and tart cherry jam. I used a super sharp white cheddar, and I’m just going to tell you: use a little more than you think you need. You’ll never regret extra cheese. I used some tart cherry jam that I had leftover from American Spoon last summer. And all I did was… place them strategically in the pastry, cover with more pastry, slice, fork press, bake and EAT. This is way too embarrassingly easy. Ummm but wait. The other version that I made? I can’t even tell you. You can probably guess what it is. This summer. And toasty. And fire. And chocolate. I mean, I really have no idea how you’d guess since I’m just soooo unpredictable. Anyhoo – this itty bitty appetizer/snack/breakfast food/side dish? We have some sweet and tart and smoky and savory in one little pocket. All covered with a bit of salt and pepper. It’s like a dang dream come true. It’s quite impossible to not hoard the entire batch for yourself. I’ll allow it. It’s okay. Place a sheet of parchment paper on your work surface. Place one sheet of puff pastry on top. Spoon 1 to 2 teaspoons of cherry jam in 9 spots on the pastry – sort of like a tic tac toe board. Place a cheese slice over top. Cover the entire thing with the other sheet of puff pastry. 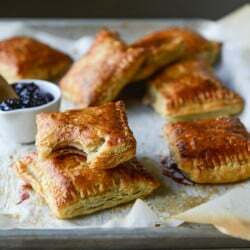 Use a large knife or pizza cutter to cut the pastry into 9 squares, just around the cheese and jam edges. Use a fork to press the edges together. Brush the tops with the beaten egg wash and sprinkle with salt and pepper. Bake for 20 to 25 minutes, or until golden brown. Let cool slightly, then serve. These are best served shortly after making. I totally want to use one of these as a raft in a river of melty cheddar. Proud child of the 90s :) Your savory pop tart/toaster pastry hybrid though totally trumps all the packaged ones though! When you look at the pics, your recipe looks hard, but then I scanned at the ingredient list and how-to and this is pretty easy. Easier than the Home Depot Book with lots of instructions the wife left me. These are what you bring in for your co-workers to build morale. But hoarding is fun too. I always broke the crust off my pop tarts and my dad would get so mad at me! They were so gross though! These are totally grown up Pop Tarts! Love them! I am a 90s child too and grew up eating them, s’mores and brown sugar cinnamon were one of my faves! Or the Pop Tart Stix’s?! Like in Chocolate Caramel?! OMG. Obsessed. Still mourning how they went away with those. But I will gladly take these smoked cheddar and cherry pop tarts and feel instantly better. whaaaaat? i never heard of the stix! I’m still waiting for the bacon and caramelized onion Pop-tart……wait I have a jar of Stonewall Kitchen Maple Bacon Onion Jam. I’ll try that with cheese in the puff pastry. also: I’ve been desperately seeking a flavor of poptart that I remember from when I was a kid: mixed berry. it was SO pretty with teal and violet frosting (teal was a swirl/squiggle) and I feel like i’ll never find it OR the childhood it embodies again… dramatic much? sigh. TOASTER STRUDELS! Those were always such a special treat at my house. Can you post a salad recipe or something? I’m on a sugar detox and this is KILLING ME. Haha. Oh my gosh. This looks AMAZING. OK, first: I’m obsessed with these pictures. GOREGOUS. Secondly, I want to eat ALL of these. Puff pastry for liiiiiiife. Rather, GORGEOUS. Oy. I’m sleep deprived. OMG I would totally eat it all myself – that savoury, sweet, buttery combination is THE ONE! I was also hooked on english muffins with peanut butter and banana and I also loved crumpets with salted butter! …toaster strudels with that icing…my mouth waters just thinking about them! Me too!! That icing was beyond wonderful. For whatever reason, my rational brain is still puzzling over the cheddar + jam combination, but my taste buds are totally on board!! In fact, I wish I had some right now. We had pop-tarts as kids from time to time, and I would do the same thing with the unfrosted crust! I am CRAZY about that filling! Homemade pop tarts are so much better than the ones you buy in the store. Can these be made ahead of time and frozen or refrigerated? These really look amazing! However that beet puff pastry tart is delicious!! It’s always something that I bring to parties. Gone in 60 seconds. I always nibbled the crusts off first and I thought it was because I was OCD (probably still is this), but maybe I was just trying to get rid of the worst part before diving into the goo. The icing for toaster strudels tastes stale. It’s gross. What a tasty combination! I was a die hard brown sugar pop tart fan growing up (gross, I know!!) This recipe looks 10,000 times more delicious though. YUM!! Man I love your creations! These sound so flipping fantastic, can you airmail please? I ate poptarts all the time as a kid. But homemade is always better! These look so good! I didn’t grow up on pop tarts (I’m old), but did grow up eating grilled cheese with jelly on top. These pastries remind me of that combo – delicious! My mom would give me toaster struddels in my lunch box and I was basically the lunchtime envy of the class, but now those things make me sick. These look so much better though – it’s a “matured” version that I’d pack in my lunchbox any day! or for breakfast or dinner… yum! My grandma used to do a similar dessert for me, when I was a child! 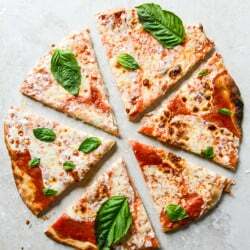 But instead of make little bites she used to make a pie with strawberry jam and a cheese very similar to cheddar ( I’m not from America :D). But yours, are the evolution, the emproved version! Perfect! Oh gosh I need this. As a pregnant lady, I totally need this recipe in my life. Um, never regret extra cheese – duh! This looks amazeballs – I am all over sweet/savory combos – yum! Have a great weekend! Can’t wait to try this! sweet + savory = life. Is the sharp smoked cheddar from TJ’s? Okay, embarrassingly enough, my college diet consisted of coffee and brown sugar pop tarts. Haha, I was poor and the Costco box was huge! But. I would take these ones in a heartbeat! They look 10-gillion times better than the boxed! I totally grew up with sprinkle-covered Poptarts and Toaster Strudels…and lunchables!! AH! My poor little body. But you know? Now I crave stuff like this. The fancier, make at home version!! Definitely need to get on this flavour!! These are incredible, Jessica! I was a huge pop tart fan growing up… I think I maybe had toaster strudels like once? If that? We always had a box in the freezer, though, because my youngest brother couldn’t get enough of ’em. But woah. 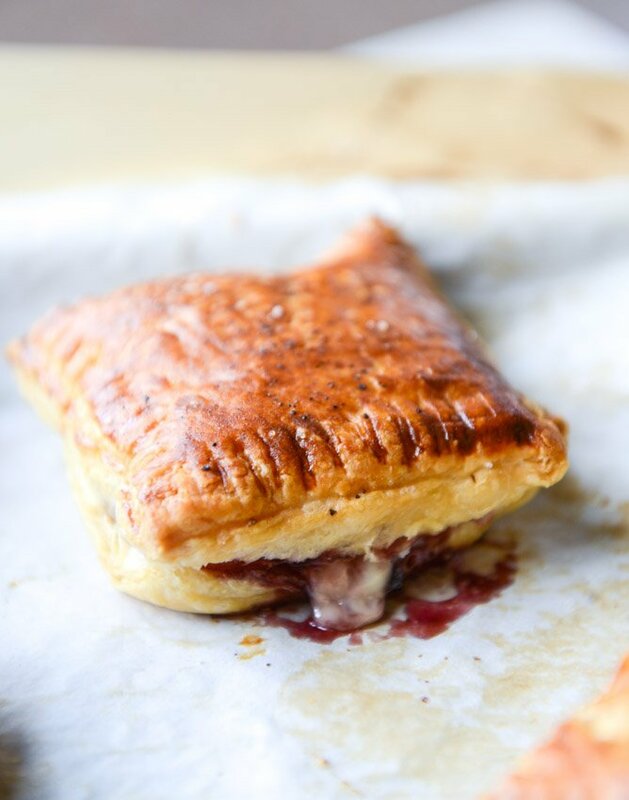 Smoked Cheddar and Cherry Jam Pastry Pop Tarts > even the most frosted, sprinkled, store bought pop tarts. Cannot even handle how delicious these look – I’ve had something similar and they’re like crack! Will have to save this recipe for Christmas or some time when I have lots of people over otherwise I will consume the lot! Yep, I am officially hungry now! And I’m happy because I found lots of things I want to make now! would i be crazy to try it with fig preserves and gruyere cheese as a combo? well, maybe not crazy – more like, would it be any good? I made this the other night and used smoked cheddar with black pepper. It was so good! My kids didn’t like it, but that just meant more for the adults! Thanks for the recipe.